Note: This tool is designed to help you identify any anomalies between your payment service provider (Ezidebit) and Gateway. Go to the main menu, click Transactions then Console Pay – the Console Pay screen displays. 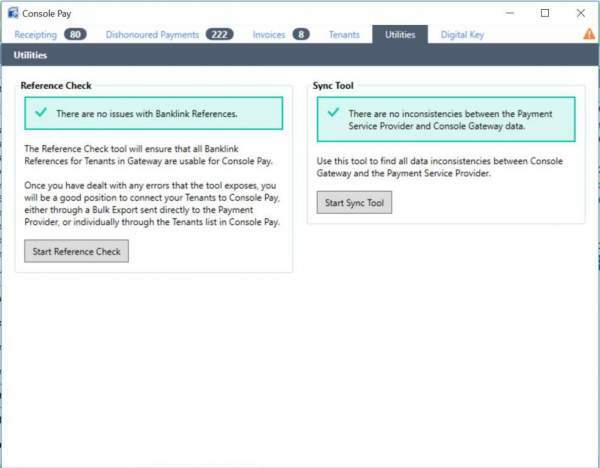 Under Payment Service Provider Sync Tool, click Start. A list of Payers with issues displays. Unknown Reference – Gateway is unable to find a Tenant file with a matching reference listed in the Reference column. Remedy – open the tenant file, click Tools, then Banklink – confirm the tenant reference entered matches the same as your Ezidebit system. Incorrect Payment Method – The Tenant referenced is not set to Direct Credit/Console Pay within the Banklink details. Remedy – open the tenant file, click Tools, then Banklink then select method as Direct Credit/Console Pay. Once you have fixed the SYNC issues in Gateway re-run the sync tool to ensure your inconsistencies are now matched. 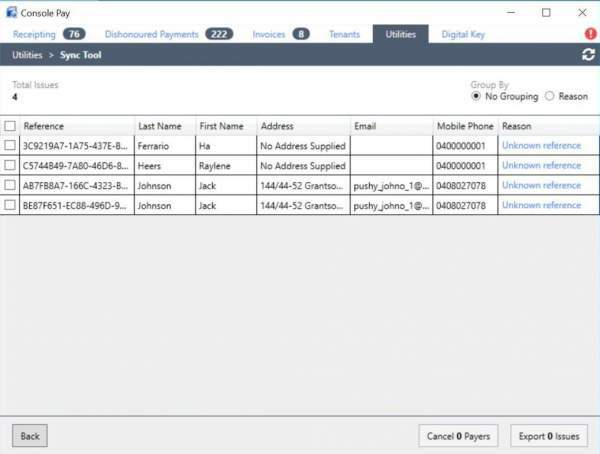 If no Payers are listed there are no issues and Gateway and Ezidebit sync automatically.